- Having your stylist on-location with you instead of at their salon is very helpful and allows us to get the "lifestyle" type photos of you and your bridal party getting ready. This is also true for having the groomsmen and bridesmaids all get ready in the same location when possible. - Tell your bridal party you want them ready to be photographed 30 minutes prior to the actual shoot time. This will ensure that any last minute snags won't disrupt the actual shoot time. 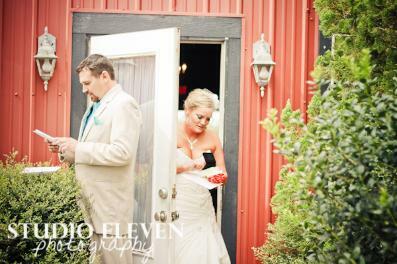 - "First Look" photos are a growing trend amongst brides and grooms. These photos allow for a few intimate moments between the bride and groom, special photos with no one else around, the time then to do many photos before the ceremony instead of after and generally erases most of the nerves pre-ceremony. - For more traditional brides there is also the option of doing "Can't See the Bride" photos pre-ceremony. - Think about exchanging letters or gifts prior to the ceremony. Not only does it make for sweet and special photos but, it also creates a lifetime keepsake of the love and anticipation of the day. 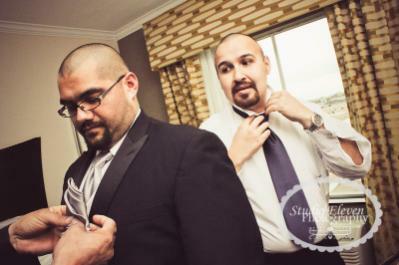 - Make sure you allot 1-2 hours, whether before or after the ceremony, for bridal party photos. We generally like to shoot the full bridal party, the groomsmen and the bridesmaids separately as well as the bride and groom alone. - In addition to allotting the time, give your full bridal party a heads up that photos will take place, when and where, as well as approximately how long it will take. The most successful bridal party shoots often entail full cooperation and genuine happiness on the faces of the bridal party. - If the bridal party photos will be taking place between the ceremony and reception you may think about keeping your reception guests busy with appetizers, drinks and music. 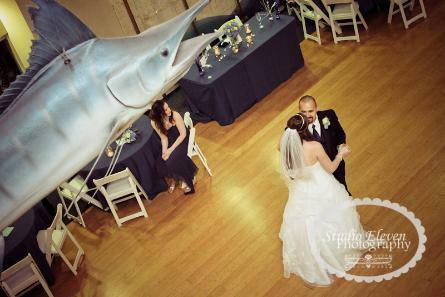 - Before the wedding, let us know if there are any special props you'd like to use for your bridal party photos. - Encourage your bridal party (as well as you and your honey!) to smile any time they see us pointing a camera in their direction! Being aware of the camera can really help make even candid photo ops all the better. This is especially important for the walk down the aisle! Smile! We have many blog and print features coming up in 2013. What makes for a great wedding publication? DETAILS! Tons and tons of details! From flowers to lighting, the details of your wedding and reception will create the look and feeling you want your guests to experience while giving you photos that are visually intriguing and inspiring to other couples. But! The details don't have to break the bank! We know weddings are expensive. If you've booked us, gotten your dress, rented the reception venue, ordered the food and are left wondering how you'll afford to decorate the wedding of your dreams we have some tricks of the trade for you. - www.save-on-crafts.com is our number one source for brides when it comes to decorating. We personally order from this website a lot so we can confidently tell you that the products are quality, the shipping is fast and the prices are more than great! No matter what theme your wedding decor is, you'll find tons of amazing items on this site. - DIY! With Pinterest and so many blogs out there, you can find do it yourself ideas and instructions of pretty much anything! - No matter what your theme, think about incorporating some details that show off who you are as a couple, as well as your individual personalities. - Come up with your dream theme and go from there. Once you've got your main idea, decide on a few large pieces that will convey that idea, then move on to the small detail items that will fill in the overall decor and bring your theme to life. Remember, no detail is too small! - If you use table lines, IRON THEM! Or have someone else iron them or tell the rental company you want them ironed or at the very least, spray them with some wrinkle releaser. Not only will it create a nicer overall finish for your guests but it will also create much better photos of your table details. While DJ's and band lights can mean extra fun for the "gettin' down" part of the evening, they just aren't ideal for the moments you really want to remember. We encourage good lighting with no disco balls or flashing lights during your key reception moments, especially your first dance. 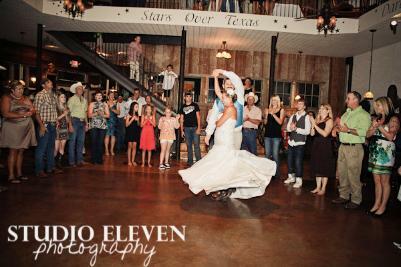 It's also very important to think about what you want your first dance photos to look like. The rushing circle of people at the end of The Grand March sure is fun for the guests but, it greatly impedes the ability to get key shots of your moment. The ideal combination for first dance photos is decent to outstanding lighting minus the dj lights, a cleared dance floor and you with your honey letting the world melt away while gliding the floor in each others' arms. 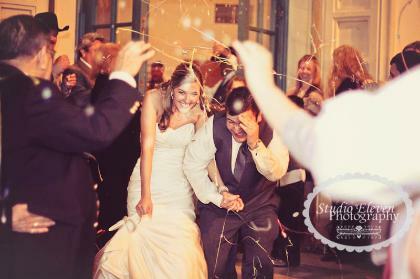 - Sparklers make great exit photos. Check with your venue that it's alright to have them before you get your heart set on them though. - The heart shaped sparklers are cute before being lit but, once they are lit you cannot tell they are heart shaped. If you find straight sparklers cheaper, go for them. - Have several people as designated lighters if doing a sparkler exit. You want to time it right so that the majority of them are lit at the same time. Think about having enough sparklers for each guest to have two. - Other ideas for exits include bubbles, streamers, confetti and the traditional bird seed. - www.save-on-crafts.com has excellent biodegradable confetti that venues won't mind you using because it washes right away and is eco-friendly. Fashion cones out of cardstock or paper for guest to hold their confetti in. - You can purchase streamer guns and streamer cannons in a variety of colors and sizes from places like amazon.com and many party supply sites. - If you are using confetti or streamers, the more colorful the better!